Rock the Future of Women's Health! 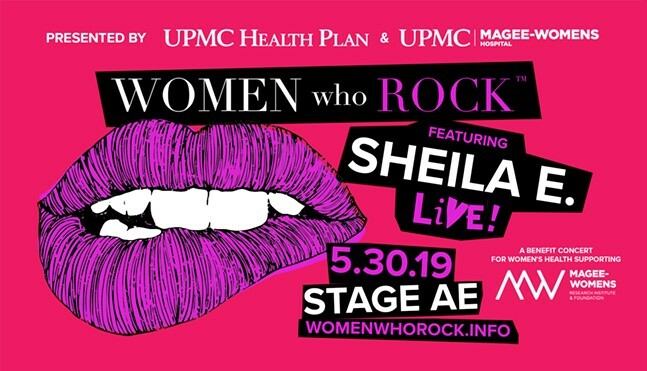 When: Thu., May 30, 7-11 p.m.
Rock the future of women's health by attending the 3rd Annual Women who Rock Benefit Concert on Thursday, May 30th at Stage AE. The stellar all-female lineup features the legendary Sheila E., the Sounds of Pittsburgh Women's Chorus, soul diva Lyndsey Smith, DJ Jess, and more! Kelly Frey from WTAE will return to present the 2019 "Women who Rock Award". WwR features a VIP Happy Hour & Lounge, VIP Gift Bags, the Beauty Bar, a silent auction, and so much more! This unforgettable night will be hosted by Michele Michaels of 102.5FM WDVE. Proceeds benefit Magee-Womens Research Institute.